The first Amlogic S905 TV boxes have started to ship, and I received Videostrong K1 Plus a few days ago, but due to some issues with Google Play Store, I’ve decided to postpone the review. 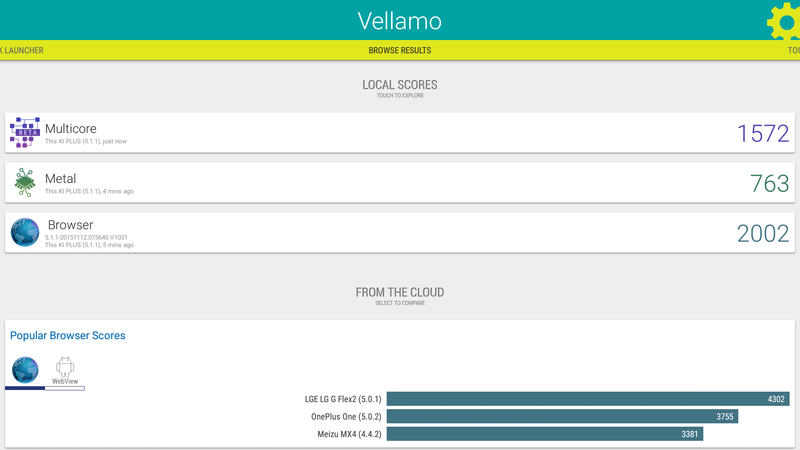 In the meantime, I’ve side-loaded popular benchmark apps including Antutu, Vellamo, and 3Dmarks to the device to compare it to its main 64-bit ARM competitor: Rockchip RK3368. I used benchmark results from Beelink i68 review and compared them to K1 Plus, both devices running Android 5.1. A ratio greater than 1 (green) mean S905 is better, while a ratio lower than 1 (red) means RK3368 fares better. Overall both platforms are pretty close for most tests, and results will vary a little between devices due to firmware optimizations and different memory and storage chips… Nevertheless, it’s no surprise that an octa core Cortex A53 processor beats an quad core Cortex A53 processor in Antutu multi-threaded tests, but somehow K1 Plus was better than Beelink i68 at multi-tasking, and had an higher score in Vellamo’s multicore benchmark… Considering S905 is clocked at 2.02 GHz (CPU-Z data) against 1.2Ghz for RK3368 I was expecting a much faster single thread performance, but in Antutu single thread performance S905 was barely faster. 3D graphics benchmarks are also at adds with Antutu showing much better 3D performance for PoverVR G6110 GPU found in RK3368 against the penta-core Mali-450MP GPU in S905, while 3Dmark Ice Storm Extreme total score was basically a draw, but looking into the details of graphics and physics scores show disparities with the GPUs having their own strength and weaknesses. The takeaway from this comparison is that the user experience on Amlogic S905 and Rockchip RK3368 based devices should feel pretty similar, with possibly a slightly edge for RK3368 when it comes to 3D games. Considering both processors are mostly found in TV boxes the most important will be video playback support, including 4K H.265, as well as price, and Amlogic S905 devices are currently significantly cheaper than equivalent Rockchip RK3368 devices. I have not tested video playback yet, but for what it’s worth Antutu Video Tester scores 899 points on Ugoos AM1 Amlogic S905 TV box, while I got respectively 532, 328, and 516 points on respectively Beelink i68, Zidoo X6 Pro, and Kingnovel R8 all based on Rockchip RK3368 processor. 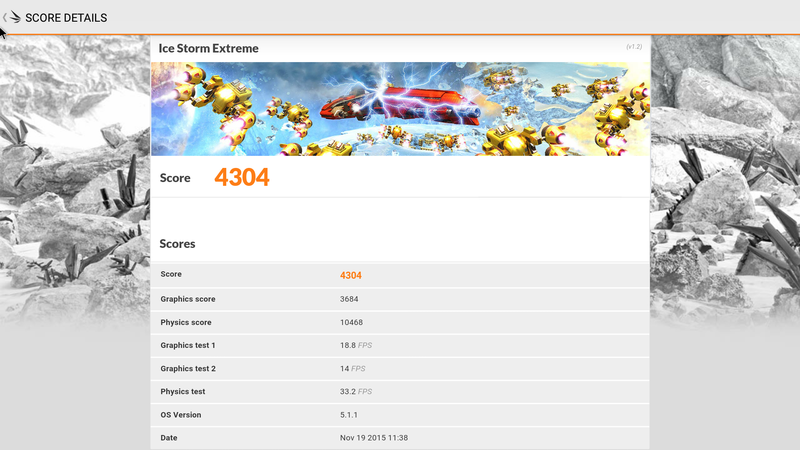 I’ve added the K1 Plus benchmark screenshots for reference below. Looking at the benchmarks I would guess that either Amlogic S905 is throttling really bad it is bottlenecked by the memory interface, or both, cause no way is that SOC running at 2Ghz . I don’t like rk3066 because has microshuttering on 1080p23.796. Amlogic doesn’t have this issue. and as Gabe said, the rk3368 ‘interactive’ governor should help getting better perf than the s905 ‘hotplug’ one. in the end, s905 throttling is obvious. It should be interesting to show the evolution of the throttling(/benchmark) issue with a real heatsink instead of the ramchip’s one on the s905 device …. All box seem so undercooled :(. 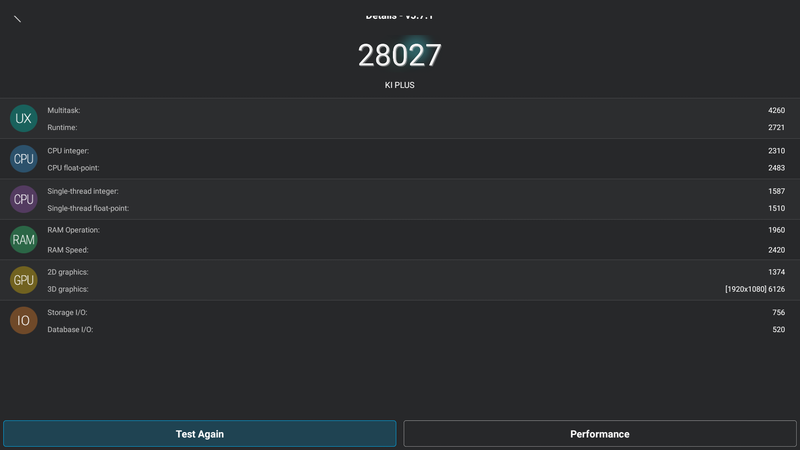 PS : I made tests on my tronsmart s89 (s802) cooled by a real heatsink and I get a 4.000 better antutu score all in 3d graphics : when a antutu test is running, the CPU are set to 2.0ghz but the GPU is throttling … In other bechmark, the improvement was 15-25% :D.
Always nice to have a faster box, but generations of Amlogic SoC has constantly been more capable Video performers. I hope this continues with the S9xx range, but as yet no media box manages to do the checkbox basics reliably. It is weird, you say RK3066 has micro stuttering, RK3188 didn’t had it (I can confirm that based on my experience with the Minix Neo X7), RK3288 has micro stuttering (again I can confirm that), and RK3368 doesn’t (based on reviews). Based one on, one off habit I would guess the next Rockchip SOC will have micro stutters problems. RK3368 have a lot of micro stuttering, and 23.796 it’s not a “based on reviews”. Can you also make S905 vs S805 comparison? I have the data for both, so it should be quite easy. It will be different operating systems though (Android 4.4 vs Android 5.1), so the performance difference between S805 and S905 will be amplified a bit. hi cnx, you are a *! Can you also make a comparison between s812 and s905. for a gaming rig with 2gb ram which should be preferred? I’ve done some benchmark comparison between S805 vs S802 (same as S812 minus DTS/Dolby) in the past @ http://www.cnx-software.com/2014/09/25/performance-comparison-of-amlogic-s805-and-s802-processors/. If you want to play games stick with Rockchip RK3288 or Amlogic S812 processors. The new processors are optimized for cost, not performance. If you have afford it Nvidia Shield Android TV would be the best, but it’s at least twice the price. So which is better if you don’t mind me dumb down the question? I use it mostly as TV media play backs, no gaming. The price are also very close right now, the thought of octa vs quad keeps me guessing. Thanks. I have been looking at these 64 bit processors versus the S812 and S802 benchmarks. i am really surprised by the fps results between these 64 bit processors and the 32 bit S802 chip. Am I missing something or is the S802 still the better buy? Amlogic S812/S802 processors have slightly better raw performance. However, they may lose it because most are still stuck in Android 4.4, while S905/RK3368 devices are all running Android 5.1. When comparing devices, you also have to look at the whole system, not only the processor, including RAM, and storage read/write speed, as well as firmware support. The new processors also support video output up to 4K @ 60 Hz (HDMI 2.0), and 4K H.265 @ 60 fps while the older ones are usually limited to 4K @ 30 Hz (HDMI 1.4), except RK3288 that has HDMI 2.0, but its implementation is flawed, and does not work with all 4K capable TVs @ 4K 60 Hz. Thank you so much for your reply and comments. You are correct, there are other factors associated with overall performance. While there are various aspects to consider, my surprise is mostly due to the core controllers associated with these new processors. I assumed that the new 64 bit core controllers would outperform the existing 32 bit system by a wider margin. Are these benchmark results influenced by the existing firmware and upgrade will yield better processor performance or is this a physical limitation? That’s the expected performance, simply because most 64-bit ARM processors used in TV boxes are using low power Cortex A53 cores, instead of the faster Cortex A57 or A72 cores. Thank you for your response once again. It makes complete sense. I am hoping the upcoming S912 processor will address this deficiency. Also, as most of these solutions are limited to a natural ventilation model would the heat generation from these new octa-core rockchip processors pose any physical deterioration and performance concerns? Amlogic S912 will still be Cortex A53 and clocked at lower frequency (1.5GHz vs 2.0 GHz) than S905. It will be octa core instead a quad core. Again for power dissipation, overall system design (hardware, and software) is important for proper cooling even with the low power Cortex A53 cores, as some TV boxes I recently reviewed perform poorly after a while. See Zidoo X6 pro review: http://www.cnx-software.com/2015/10/09/zidoo-x6-pro-android-tv-box-review/, and comments section where the device gets ~32,000 points in Antutu after boot, but the score drops to ~12,000 points if I run the same benchmark after playing a 4K video for one hour. It still amazes me that TV boxes can’t quite get it right. I use an old tablet with an a31 processor that plays HD just fine and 4k with limited stuttering. 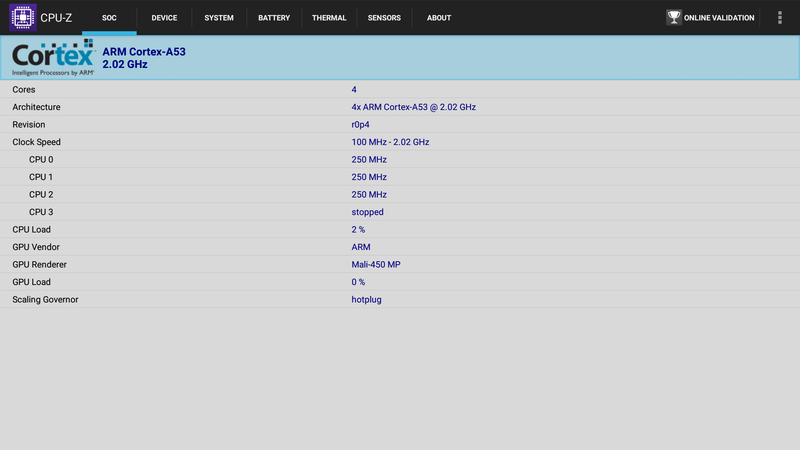 At least Rockchip finally decided to use a 2 year old GPU rather than the same old Mali. As far as Amlogic goes, the chips are getting better with each incarnation even with old Mali technology. Keep an eye on the MSTAR MSO9180D1R soon to be added to TVs to do away with set top boxes for cable providers. Check out the Zidoo X9, I got one for my brother and it works flawlessly so far. The HD PVR is great as well. Sorry I got a little off topic but just wanted to state both chips are capable, it’s just the firmware that needs a tweaked a little. I have both the 3368 and s905 and both work well. The 3368 is definately better for 3D games but playback times on movies the 905 seems better. But as I said my brother’s MSTAR MSO9180D1R in the Zidoo is fantastic for viewing any recording your shows. Thanks for reading and I would like to hear from others who own boxes with these chips to see if I should expect any problems in the future. how can i put channel list in K1 Plus Amlogic S905 from pc or with usb ? ? hi give me an email [email protected] and i will help you. Interesting given recent AMLogics outing, for GHz and benchmark cheating. Will be there an rk3368 vs s912 comparison as s912 is out? Especially curious on the heat differences. I think 3399 will be quite late and will start as a pricey one when it comes out. But keep up your backlog first. I don’t have recent benchmark results for RK3368, except for Antutu 6.x on Coowell V4 @ http://www.cnx-software.com/2016/09/04/coowell-v4-android-tv-box-review-part-2-camera-skype-google-hangouts-and-duo-by-google/. But it only got ~23,500 points so that seems way too low.